Hello, I sold a BloodBrothers account for 250$ on this website. 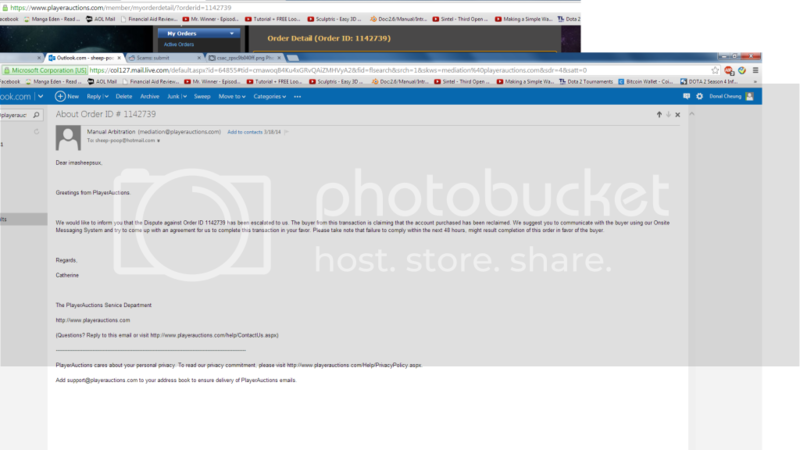 http://i224.photobucket.com/al... The transaction by the seller (me) was fully completed on the feb 23rd and the way playerauctions work is after the buyer gets the info he gets 3 days to confirm that he got the account fully and if 3 days afterwards he doesn't confirm then it is automatically assumed it is confirmed. The site was bugging and didn't auto confirm it so I went through support to get it closed which was on the 28th (5 days after). The disbursement of the money was suppose to be on March 16th and on March 18th is when they send me a email that there has been a dispute on the case (4 whole weeks after). 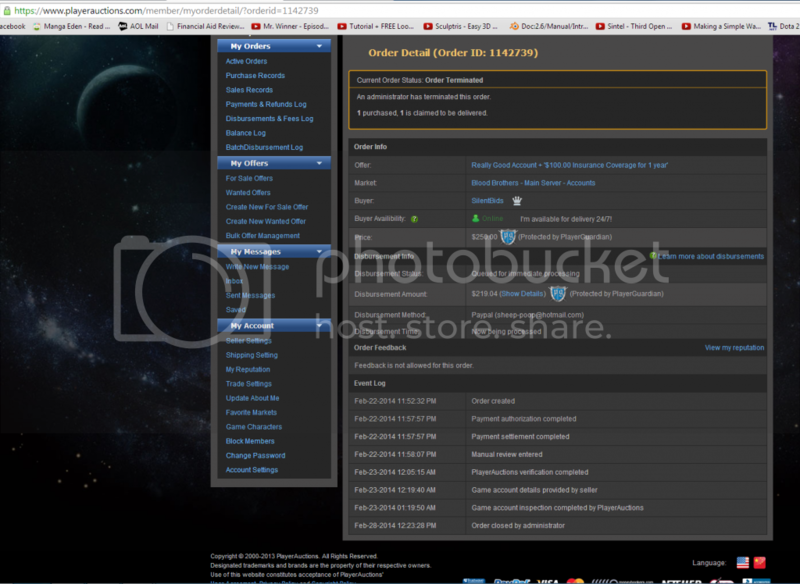 http://i224.photobucket.com/al... Basically they are telling me that the buyer lost the account the day he received the account but he had 3 whole days to dispute it which he did not and now he does it 4 weeks later is why I am mad. Playerauctions is making me negotiate refund with this guy who is probably a scammer. Basically they tell me to try my best to help him get the account back (there really is no way if it got stolen). I basically ended up contacting the admins of BloodBrothers and got it retrieved because they linked it to my original device but the account was empty by then (items was what makes it worth anything). They still want me to negotiate with this guy for refunds. The buyer proposes I get 60$ refund and he gets the account and the rest of the money (LOL). This playerauctions thing is either dumb or it has the biggest flaw ever. I can't believe you can just buy an account, take all the items, and then dispute it after the 3 day dispute period and get all your money back. This is bull**** and I hope no one else uses this website because playerauctions does not follow their own system.